Need a ride to SFTY3rd? Or have room to spare? Check out our 2019 Rideshare. Our 6th annual SFTY3rd will be held on May 10-12 in Scarborough, Maine for any Firefly that is interested in volunteering for a Firefly Safety Core (First Aid, Rangers, Sanctuary, Fire volunteers) or any Firefly Core volunteer that interacts with Safety in emergencies. What is SFTY3rd you ask? It is a training/social weekend and an awesome opportunity for people working in Firefly Cores to get involved, learn about working together in incidents and emergencies and meet other Core Leads and volunteers. Why should you attend in 2019? The location will be in Scarborough, Maine. 15 minutes south of Portland easily accessible by bus and train from Boston. There is plenty of inside meeting/sleeping space in the finished barn. We are hoping for some warmer weather, nice enough to be outside for those that want to camp out. Plenty of yard and forest space for camping and meeting. Bring yer tent! This is not a party weekend. It is a weekend to learn, relax and socialize with fellow Safety Core volunteers. There will be a small fee to go towards food for the weekend. $10. Arrive anytime after 5pm on Friday or before training starts on Saturday at 9am. Training on Saturday goes til 7:00pm. 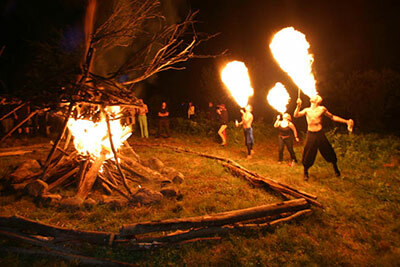 Then social time and bonfire Saturday night- get to know members of all Safety Cores. Sunday will be more training after breakfast then wrap up by 2. Get involved, get trained and meet Safety Core Leads and volunteers! Get a head start and take the ICS 100-b from FEMA here. Firefly ICS adheres to the same basic principles and procedures as FEMA ICS. Follow the chatter on Facebook at here. Any questions can be sent to SFTY3rd@gmail.com.